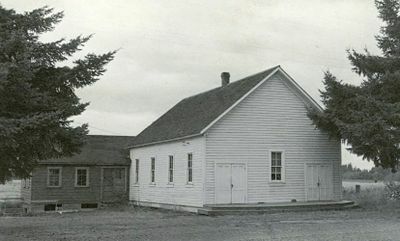 Bethel Mennonite Church in Canby, Oregon on 28 July 1948. Source: Mennonite Community Photograph Collection, The Congregation (HM4-134 Box 1 photo 010.8-5). Bethel Mennonite Church (Mennonite Church), located about eight miles (13 km) southeast of Canby, Oregon, and an equal distance from Hubbard and Aurora, was a member of the Pacific Coast Conference. Members of the Zion and Hopewell congregations living in this community, five to ten miles (8-16 km) from their respective home churches, held Sunday school and preaching services in local schoolhouses while the roads were muddy in the wet season and dusty in the dry season, until 1912, when a church was built for their community. On 4 May 1919 a congregation was organized and a resident minister placed in the community. Such names as Roth, Mitchell, Strubhar, Nofziger, Bond, Hostetler, Rogie, Yoder, Troyer, Christner, Kropf, Bressler, Schultz, Greenwood, Miller, Kauffman, Good, Snyder, Zook, Schrock, Gingerich, Bontrager, Switzer, Diener, and Birkey were known as being or having been among the worshipers at Bethel. In 1953 the membership was 80. Due to declining attendance the congregation disbanded in 1969 when the membership was about 35. Lind, Hope Kauffman. Apart & together: Mennonites in Oregon and neighboring states, 1876-1976. Scottdale, PA: Herald Press, 1990: 51. Shetler S. G. Church History of the Pacific Coast Mennonite Conference District. Scottdale, PA, 1931. Gingerich, F. J. and Sam Steiner. "Bethel Mennonite Church (Canby, Oregon, USA)." Global Anabaptist Mennonite Encyclopedia Online. 2008. Web. 19 Apr 2019. http://gameo.org/index.php?title=Bethel_Mennonite_Church_(Canby,_Oregon,_USA)&oldid=116999. Gingerich, F. J. and Sam Steiner. (2008). Bethel Mennonite Church (Canby, Oregon, USA). Global Anabaptist Mennonite Encyclopedia Online. Retrieved 19 April 2019, from http://gameo.org/index.php?title=Bethel_Mennonite_Church_(Canby,_Oregon,_USA)&oldid=116999. This page was last modified on 31 March 2014, at 06:34.